"If Pippa Middleton and Megan Fox had announced their intention to marry during a live theatrical production of Fifty Shades of Grey starring Benedict Cumberbatch, and then taken off their clothes to reveal their bodies tattooed with the text of the eighth Harry Potter novel, they might just have approached this level of frenzy. But probably not, the boy said, because not everyone liked Benedict Cumberbatch." — Tigerman by Nick Harkaway. Frenzy is precisely the right word to describe the atmosphere on the rapacious backwater island of Mancreu. On any other day, it might not be. But these days are different. The former British colony is sitting on a volcano poised to belch a mysterious and toxic elixir of chemicals into the atmosphere. The international community, concerned for its own safety, is determined to do something. Their solution, expectantly enough, is to blow the entire island up. And while this idea might not work, everyone will feel satisfied that they at least did something. It's the end of the world for Mancreu. And everyone feels fine. Except, not everyone. Sergeant Lester Ferris, who is acting British Brevet-Consul by default, has befriended a brilliant street kid with a comic-book fixation. He appropriately calls himself Robin. Like many of the citizens of Mancreu, his fate is uncertain. Once the international community evacuates the island, the boy will need a new home. And the war-weary 39-year-old veteran of Iraq and Afghanistan sees himself as a candidate to become the boy's father — assuming he is an orphan. Robin may need some additional help too. As the island's fragile society begins to break down in the face of a manmade doomsday, the multinational array of shady businesses that have parked themselves offshore are growing restless. Called the Black Fleet, this illicit collection of ships includes spy stations, arms dealers, offshore hospitals, money-laundering operations, drug factories, torture centers, and other nasty elements. The societal breakdown and offshore urgency eventually collide when a gang bursts into a citizen's bar and shoots it up, killing Robin's friend Sholax. It is this event that kindles Robin's idea that what the island really needs is a superhero — one that he believes can be assumed by Sergeant Ferris. While never intending to do much more than appease the boy he is beginning to love like a son, Ferris agrees to assume the identity of a superhero conjured up from the boy's imagination. At minimum, Ferris believes he can investigate the murder as Tigerman while following orders to do as little as possible and watch over the former consulate house. This passive plan fails outright and Tigerman not only captures the heart of Mancreu, but also the attention of the entire world. 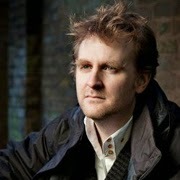 A few graphs about author Nick Harkaway. Nick Harkaway burst onto the literary scene when his first novel, The Gone-Away World, found itself in a seven-way auction between publishers. 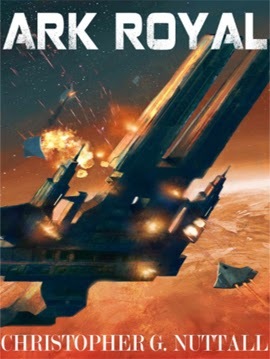 It was eventually won by Heinemann, which paid a £300,000 advance for the story about special operatives who are hired to perform a mission in an post-apoclypic world. He followed this novel up with Angelmaker. He was originally born Nicholas Cornwell and educated at the University College School in Norht London. He studied hilosophy, sociology and politics and took up Shorinji Kan Jiu Jitsu. He doesn't talk about such as much, preferring to share more important information like enjoying Italian red wine, unlikely clothes, Chinese food, good-humoured anecdotes, Argentine tango, Swiss cheese, American burgers, carving skis, alpine snowboards, P G Wodehouse, Alexandre Dumas, and blonde human rights lawyers (especially the one he married). They have two children. He is full of win. Tigerman By Nick Harkaway Punches 9.2 On The Liquid Hip Richter Scale. 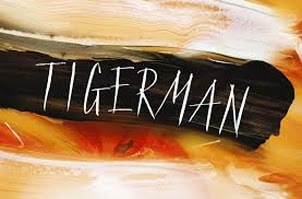 Tigerman has an authenticity that slowly sneaks up on its readers as Nick Harkaway tackles parenthood, friendship, and loyalty under the guise of secret identities, heroes, and what it really takes to be one. Although contemporary, the tone has an expressly human and vintage quality to it. It is one of those rare books that someone reads and feels like a better person for having read it. Tigerman: A Novel by Nick Harkaway is available from Amazon or can be downloaded for iBooks. The audiobook is also available from iTunes, narrated by Matt Bates who brings the story to life by balancing the protagonist's pragmatism and boy's enthusiasm. 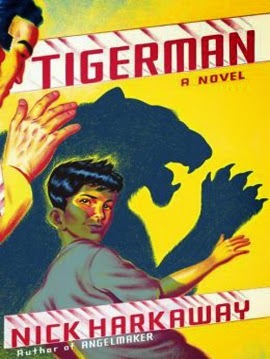 You can also order Tigerman by Nick Harkaway from Barnes & Noble. The resurrection of Dinosaur Jr. with I Bet On Sky sparked some speculation whether or not Joseph Donald Mascis a.k.a. J Mascis would ever get around to producing another solo album. Tied To A Star puts that question to rest with even more contemplative confidence from the soft-spoken artist. Building upon Several Shades Of Why, his solid solo debut with Subpop Records three years ago, Tied To A Star is an intimate revision of his quieter side with 10 tracks that have all the heart of just happening to be around when Mascis picks up a guitar. Half the songs sound so spontaneous that you can almost imagine him smiling, "Hey, listen to this. It's something I've been working on ..."
It could be said that the album was almost approached this way. It was recorded and produced by Mascis and mixed by John Agnello at Bisquiteen in Amherst, Massachusetts. Some of his friends who turned out to make guest appearances include musicians Ken Maiuri (Young@Heart Chorus), Pall Jenkins (Black Heart Procession), Mark Mulcahy (Miracle Legion) and Chan Marshall (Cat Power). Tied To A Star captures the quiet contemplation of J Mascis. Don't expect too much roar from his guitar, drums and vocals on this album. While his brilliance shines through, almost all of it is handled as delicately as his interviews. The lyrics are laconic, the tone is soft and precise, the treatment is heartfelt and dreamy. The lead track, Every Morning, recently appeared on Funny Or Die as a video featuring Mascis as a cult leader named Space Angel. 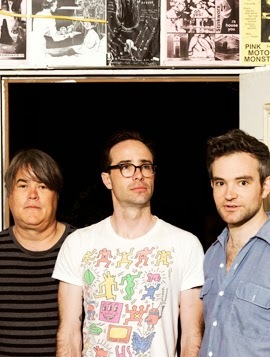 The cast includes some great guest appearances too, including James Mercer, Peter Holmstrom, and Fred Armisen. Although Every Morning has an upbeat tempo and crisp guitar work that stands out like a second chorus, the lyrics are not especially cheerful. In short, Mascis makes the case that it's a struggle to make it through the morning. Wide Awake, which was also released in advance of the album, is much more cheerful. It opens with some amazingly gentle guitar work right out of the gate. The track paints the picture of Mascis waking up ahead of his partner and wondering about their life together. He's eventually answered by Marshall with a response that merely echoes him as the song matures into a duet. It's treated as a tender, private moment that Mascis compresses into the confines of a few minutes. 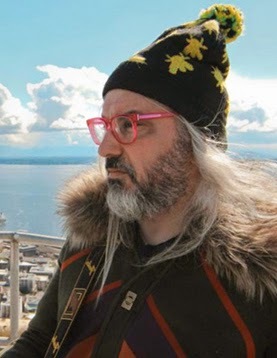 Much like both tracks allude to, Mascis has abandoned much of the minimalist nature of Several Shades Of Why and expanded his solo compositions to include texture. His guitar work remains the cornerstone of this album throughout. His tender and restrained vocals only lend a distant and often lonely uniqueness in comparison. Heal The Star is probably the best track on the album, with both a signature strum and strained falsetto until the uptick toward the end. The instrumental Drifter captures what some mistake as a slacker sensibility. And Then and Trailing Off are relaxed indie rock numbers that will remind some people of Several Shades Of Why, except with much more musical depth than an acoustic alone. There are some instrumental shifts and surprises on both tracks before Mascis eases into his closers. Come Down an Better Plane are thoughtful pieces, with the former being modestly hopeful. Tied To A Star By J Mascis Rounds Out 7.8 On The Liquid Hip Richter Scale. Tied To A Star is exactly what someone might expect from a J Mascis solo album. It's not groundbreaking as much as it is a glimpse at his mastery of music. Anyone who appreciates his work will fall for this one. You can find Tied to a Star [+digital booklet] by J Mascis on Amazon or download the album from iTunes. The vinyl edition of Tied To A Star is listed on Barnes & Noble. J Mascis is touring to support the album. For tour dates and venues, visit him on Facebook. After the wildly successful 4-track Out Of The Black EP last March, Royal Blood was already primed for a sensational self-titled debut. But now, even better than being primed, the band lets it all loose. The self-titled album Royal Blood adds seven more tracks to the original outing of four, with only the primitive and bluesy track Hole left out. Now the two-piece band from Brighton fires up a sound that is greater than the sum of its parts. Michael (Mike) Kerr and Ben Thatcher rip away with heavy riffs, gritty grooves, and tenacious drum work. And no, it doesn't hurt that Kerr can wake up the neighborhood by playing bass like it's a six string. 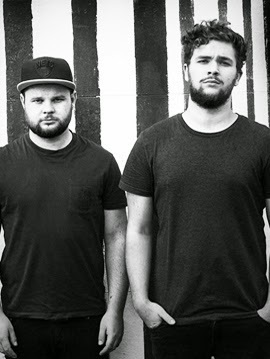 Royal Blood is the real deal from Brighton. Signature tracks like the big and meaty Out Of The Black, an unrequited love story tucked inside Little Monster, and grit and dirt of Come On Over remain standouts on the album. But along with all three of these beastly numbers, Royal Blood manages to bang out several more. Figure It Out takes on a much more classic rock sound. More than any other track on the album, it makes a convincing case that the Royal Blood is one part Jack White and one part Joshua Homme, with a splash of The Black Keys. It's a perfect libation for anyone who likes sweaty and relentless rock. Figure It Out easily takes its place along the EP rockers, except it breaks from the heart just a bit and aims a little higher. The explosive song can be easily be considered a coming of age track, hard lessons learned and then reluctant acceptance. Sure, it's still tied to relationships, but there could also be a broader meaning here. As for the rest of the album, the White-Homme-Keys comparisons don't hold up nearly as much. 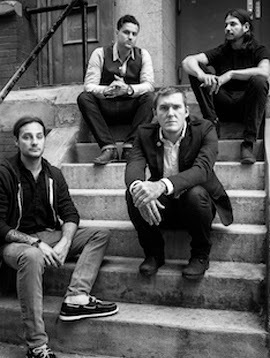 The balance of the tracks add more whomp and soul to their blues-rock than the bands to which they are most often compared. There is something originally massive about the band, which is why some reviewers see them at the forefront of a Brit rock revival. For every classic rocker like You Can Be So Cruel, Royal Blood couples it with something more beat-driven and soulful like Loose Change. It's harder to like the latter, but the overall theme is still intact. These long-time friends have a knack for new sounds without overdubs and studio polish. Some of the real winners being heard for the first time on this album include the deliciously mournful Blood Hands and the chug-friendly complainer Better Strangers. But even on tracks like Ten Tonne Skeleton and Careless that don't capitalize on the winning instrumental drone of Kerr and Thatcher, Royal Blood used those numbers to bust up any predicability on the album. Both songs also (Careless especially) have sections within that soar over an already high bar. The Self-Titled Debut By Royal Blood Blisters 8.1 On The Liquid Hip Richter Scale. Although Royal Blood originally came together in 2012, their debut still marks them as one to watch. Hands down, they are one of the best breakout bands this year. And if you aren't sure why at first, give some of the strongest tracks a listen again for what can only be described a smoky ruthlessness. Royal Blood can be found on Amazon. The self-titled album can be downloaded from iTunes. The vinyl edition of Royal Blood is available at Barnes & Noble. For touring information, check them out on Facebook. 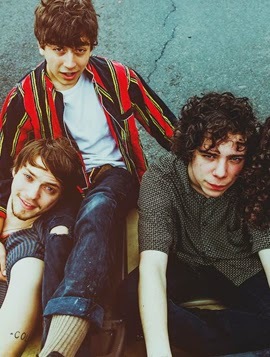 On the quick, they are currently completing a tour in the United States before crossing into Canada in October. By November, the band will be booked up in France before taking on the rest of Europe. Ask Justin Bailey who he most wants to be at age 17 and the answer comes easy. 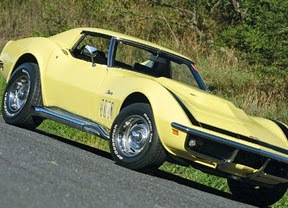 Nick Campbell is a genius in the garage, specializing on high performance rebuilds and modifications. He is one of the few men left who can hear an engine and then visualize every inch in operation, from the valves as they open and close to the crank as it whips through the oil. As a rudderless teenager still smarting from the divorce of his parents after his father declared he liked men, Bailey was primed to look up to the mechanic. Campbell was strong, intelligent, and masculine — everything he wanted his father to be. The internship was a dream come true. There was nothing more important to Bailey than becoming accepted by the crew, especially Campbell and his wife Mary Ann. And it doesn't take long before his admiration transforms itself into idolization. Bailey didn't just admire Campbell, but everything the living legend made his own. The Spark And The Drive smolders with adulation. With such high expectations, it doesn't take long for events to chip away at his muscle car mechanic pedestal. He noticed it all, every little miss on an engine or careless cleanup. He was human too. Not only is his mechanical talent losing its touch, but Bailey discovers very little of Campbell measures up to the ideal the boy had conjured to make a role model. All it takes is a tragedy to push everything over the edge. And as Campbell reels from the impact, Bailey steps in to console an increasingly distant Mary Ann until the empathy becomes affection. While initially torn between supporting his mentor and embracing the woman of his dreams, Bailey begins to wonder whether Campbell deserves the life he had built in Connecticut. All of it — the reputation of the garage, the trust of his employees, the loyalty of his wife — seemed to be terribly up for grabs. It wouldn't take much to push everything over the edge. It's a poignant and powerful story that transforms an isolated but intelligent teenager into a passive-agressive protagonist who longs to become the idolized version of a man who would do anything for him. But instead of being satisfied with the salvation this friendship might afford him, Bailey invents a one-sided rivalry between himself and a mentor who is blind to it. A few more graphs about author Wayne Harrison. Before working as a corrections officer in Rutland, Vermont, Wayne Harrison was an auto mechanic in Waterbury, Connecticut. As a first-generation college student, he originally pursued a degree in criminal justice before discovering a passion for creative writing. Since, his short stories have appeared in numerous anthologies and literary reviews. 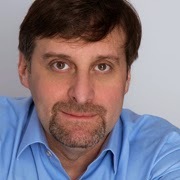 One of his stories was also recognized as notable in the Best American 2009. Another received special mention in Pushcart Prizes 2012. 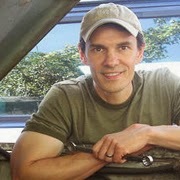 His fiction earned him a Maytag fellowship, an Oregon Literary Fellowship, and a Fishtrap Writing Fellowship. 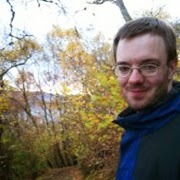 He also teaches writing at Oregon State University. While his experience as an auto mechanic lends notable authenticity to the novel, it's Harrison's ability to convince readers to be sympathetic to Bailey that makes it so remarkable. By moving the story forward with objectively vivid detail and as an unreliable narrator, it's easy to become lost in the environment and accept one justification after another until agreeing with darkest of revelations. The Spark And The Drive By Wayne Harrison Revs 9.1 On The Liquid Hip Richer Scale. Along with his tenuous coming-of-age story that touches on loyalty, loss, and betrayal, Wayne Harrison captures a snapshot of an era when cars were held together by moving parts and muscle as opposed to computer codes and components. As all of it seems to slowly slip between the fingers of the men who work at one of the last classic high performance garages, so does their innocence. 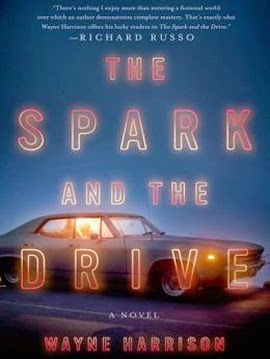 The Spark And The Drive By Wayne Harrison can be found on Amazon. 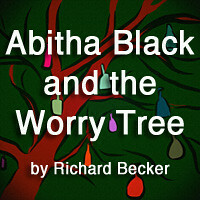 You can also download the novel from iBooks or as an audiobook from iTunes. The narration by Quincy Dunn Baker is impeccable, punctuated by his ability to capture the naivety of the protagonist and the gruffness of his colleagues. Barnes & Noble also carries The Spark And The Drive. Frozen Letter is full of firsts for the raucous rock band Spider Bags. It is the first album out with Merge Records. And it is the closest frontman Dan McGee has ever come to making the record he set out to make. The band started recording in late June last year with McGee hoping to lay five tracks down and then finish it up later in the year. All that changed when his wife told him she was pregnant. If McGee wanted to be freed up for the birth, the band needed to wrap at least eight. So Steve Oliva (bass) and Rock Forbes (drums) took to sleeping at the studio to get it done. At the end, it was pretty impossible to tell which five tunes McGee came into the studio with in his head and which three were composed off the cuff. 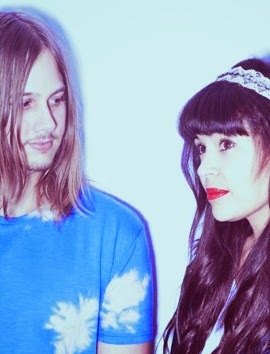 Frozen Letter is a sonically nimble album with overwrought vocals. Back With You Again In The World kicks things off with a late fifties du-woppy groove. McGee brings his best relaxed vocals, easing into the album like the jazz-anointed rock and roll playing in the background from a big and plush wingback chair. It's gripping and comfortable, start to finish, while teeing up the bouncier Japanese Vacation jangle to liven everything up. Chem Trails starts with a juicy kiss before McGee and company unleash a trip worthy and blistering onslaught of distorted spooky-dom. The analogy of becoming zombified by chem trails works perfectly with this freakout ditty written by McGee. The video makes the moment even more fun thanks to director Jonny Look and producer Chris Mast. 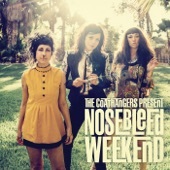 As a head melt garage rocker, there really won't be any better produced this year. It's all good fun. According to McGee, Coffin Car really kicked off the creative process and gives the album its name. He imagined picking up an old refrigerator magnet out of the snow, making it feel like finding a buried treasure from yesteryear. That is the point of the album too. When McGee started writing it, he wanted to make an album that sounded like someone was playing a stack of found singles from the seventies. It's one of reasons that even the occasional fifties influence sounds filtered by another era. Tracks like Summer of '79, for instance, finds its home in an era that would have likely paid homage to it (right up to the bass-heavy transition anyway). Where Frozen Letter works overtime is in how the songs interrelate so well together. After recording a few records, McGee says it's one of the most important lessons to learn. People identify with songs that relate to each other and the rest just fall through the cracks. "You can’t just put all your best songs on a record, because it just doesn’t work that way," McGee told AudioFemme in another interview. "People don’t hear it that way." Although the front half and the back half almost sound like two sides to a record, McGee does manage to preserve a continuity if not the pace of a perfectly addictive and gripping album that is hard to turn away from. And with eight new tracks in the arsenal, Spider Bags will likely light up their live appearances with a 50-50 split between the new material and what have become classic fan favorites. Frozen Letter By Spider Bags Ramps Up 8.6 On The Liquid Hip Richter Scale. For a band that started out as a long distance relationship between friends who occasionally played together, the band and its lineup have finally solidified into something that feels permanent. While McGee will always be at the heart of the band, it seems like Oliva and Forbes are making themselves right at home. It only makes sense. After two albums, several singles, and playing as the backup band to North Carolina bluesman Reese McHenry, Spider Bags has come together nicely on the psychedelic landscape. You can find Frozen Letter on Amazon or download the 8-track recording on iTunes. Barnes & Noble carries the vinyl edition of Frozen Letter by Spider Bags. Visit their Facebook page for upcoming engagements. See them live. It's worth it. 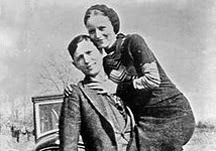 Bonnie Elizabeth Parker and Clyde Chestnut Barrow captured the attention of the American public during the Great Depression. And at age 16, Weldon Avery Holland was no exception when Bonnie and Clyde happened to drive through his grandfather's farm in the spring of 1934. While Weldon had no love for them as outlaws, he envied their audacity to defy convention and change their fate rather than accept it. If he could muster a similar strength, there would be no question what he would do. He would convince them to rescue his mother from a mental institution. But Weldon, as taken by the outlaws as he was, never has the chance to solicit their help the first time. His grandfather, retired lawman and struggling rancher Hackberry Holland, asked them to move along. They oblige, but only long enough to return and tempt Weldon into the woods. Wayfaring Stranger is a sweeping historical epic. The second encounter might have proved fatal for Weldon Holland had Parker not intervened. She asks him to pretend they never met, but imagination is not enough. His grandfather confronts them and Weldon takes a shot of their car as they drive away. Later, however, he would grow to think of Bonnie as his first real love. He would meet his second real love, Rosita Lowenstein, a little more than 10 years later after he and his sergeant Hershel Pine barely survive the Battle Of The Bulge. The two men find Rosita abandoned and left for dead in an extermination camp. The three of them manage to walk out of the Ardennes together. The bond between them is inseparable, even if they are briefly separated after reuniting with the Allied lines. Hershel pledges to make Weldon a partner in an oil pipe company. And Weldon convinces Rosita to come back to Texas with him, where the two men intend to make their fortunes. 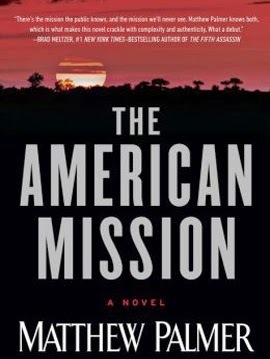 It's in Texas that James Lee Burke lays out his epic story of a plaintive soul on a journey through life as the reward for surviving the war is cut short when they meet millionaire and former Marine aviator Roy Wiseheart and his anti-Semitic wife Clara. Although Wiseheart makes himself out to be an ally, his wife takes exception to Rosita for her heritage and Hershel's wife, Linda Gail, for catching the eye of her husband. Burke manages to capture both the promise and the plague of the American dream in that it invites both honorable underdogs and unscrupulous elitists to the same table. In doing so, however, there is never any guarantee elitists will like it. They are just as inclined to shake someone's hand to buy someone's ingenuity as they are to bite it and then take what they want. 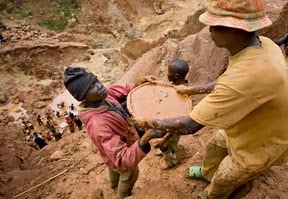 Their resources are deep. 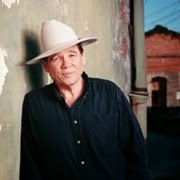 A few more graphs about author James Lee Burke. 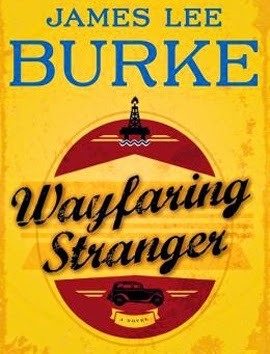 Although Burke's fascination with allowing stories to circle back to the beginning may feel predictable to some, most will discover the Wayfaring Stranger as his finest work. As a historical thriller painted with the lush and vivid colors of the final frontier days and his proclivity to test the mettle of his characters, Wayfaring Stranger resurrects an American dream in all its glory and trappings. The novel feels especially authentic as Burke has often said that he considers the Holland family to be the one that bears the most resemblance to his own. Some similarities are apparent. Burke grew up along the Texas-Louisiana Gulf Coast. While he earned bachelor's and master;s degrees from the University of Missouri, he has also worked as a landman for an oil company, college professor, and social worker. Wayfaring Stranger By James Lee Burke Wanders 9.6 On The Liquid Hip Richter Scale. Wayfaring Stranger is a thriller at its core, but a love story at its heart and a tale of perseverance in its head. As such, the story is both ambitious and beautifully told as it shares the life of a man who grew up and out of the American Depression. Simply put, it is an inspiration from a time when men were tough and women were cut from a different cloth as they faced challenges with nothing but each other. Wayfaring Stranger: A Novel by James Lee Burke can be ordered from Amazon or downloaded for iBooks. The audiobook is narrated by Will Patton, who is well regarded for the life he breathes into the work. Nobody could read this book better. Wayfaring Stranger by James Lee Burke is also available at Barnes & Noble. Not everybody remembers it, but Frightened Rabbit frontman Scott Hutchison started out as a solo artist. Even Frightened Rabbit was a solo project before Hutchison enlisted his brother Grant for his debut album, Sing The Greys. It wasn't until the band signed with Fat Cat Records that anything changed. 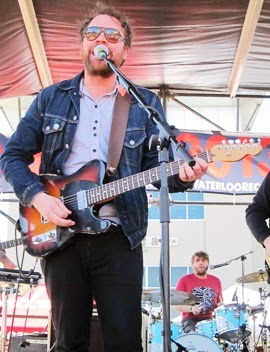 By the time Pedestrian Verse was released last year, Frightened Rabbit had grown to five members. Despite being one of the band's best efforts, made up of dark moods and darker deeds, Hutchison was becoming largely disenchanted with its direction and decided to take a break as Owl John. Although this break includes guitarist Andy Monaghan (Frightened Rabbit) and Simon Liddell (Olympic Swimmers), the outing is clearly Hutchison. As he has occasionally noted, more members meant being less noisy and more anthemic. This isn't the case here. Owl John is stripped back and indie rock raw. The debut album features ten tracks that open up Hutchison in ways Frightened Rabbit never could. Opening the album with Cold Creeps immediately sets the claustrophobic tone, which is significantly more pained than being alone. Even surrounded by people, the stress tightens up on him. It's this unabridged look inside of Hutchison that makes Owl John such a compelling album. Even on shorter tracks like Hate Music, Hutchison outlines all the character flaws and labels carried around by John. He is everything from a homeless man and priest to a wino and a thief. Hate Music rings with an unforgettable indie folk rock intensity. It's about a man who sees all his frailties and failings as unsurmountable. Everything he has done in the past has ensured how he expects to be put to rest. If you have a chance, check out the recently released video too. Red Hand, toward the end of the album, is considerably smoother in comparison. The song includes his all too familiar scowl, but remains surprisingly gentle given the suspiciousness and eventual disappointment that frames it until the end. There, Hutchison considers a resolution that whatever wrongs have been done don't really mean anything. The reckless energy, always looming darkness, and well-balanced distortions mark most of the tracks. Don't Take Off The Gloves smacks of betrayal. A Good Reason To Grow Old whispers at wisdom. 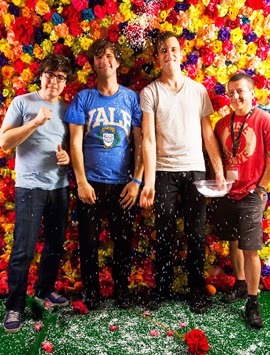 Stupid Boy is a self-deprecating confession that wraps up the album on a musical high note and a lyrical low note that almost apologizes for every other topic covered. While Owl John is a departure from Frightened Rabbit, there are some anthemic glimmers on the album. Two and Songs About Roses soar as much as any compositions one might expect from the band. 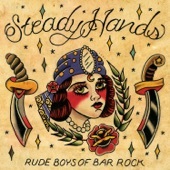 They're good tracks, even if it's easy to acquire a taste for the rougher edges found everywhere else on the album. The brilliance of this album resides in how personal it is. There are reasons some people have likened it to a purge, even if there is something more elegant in the offering. Owl John offers up a rich diversity and independence that allows fans to see Hutchison again as opposed to the collective nature of Frightened Rabbit. In many ways, you might be surprised to find you like his solo work even better. The Self-Titled Debut Of Owl John Reveals 9.2 On The Liquid Hip Richter Scale. As for Frightened Rabbit, the band seems to be getting along fine with the new lineup since Gordon Skene left over creative differences. The departure has given Simon Liddell a greater presence during live performances. Owl John has also committed to a few shows since the album release. Visit Owl John for details. The self-titled debut Owl John can be found on Amazon or downloaded from iTunes. You can also find the self-titled album by Owl John at Barnes & Noble. While there is no way to know when Hutchison might start working on another solo contribution, there is no doubt this one will leave you wanting more.